For public safety leaders around the world one fact is certain: While the basic mandate to maintain law and order remains the same, the environment in which this mandate must be carried out is changing dynamically. Fueling this massive shift are robust social, political, and economic pressures, ever more powerful technologies, and rapidly evolving threats to community safety. It’s imperative in this new era of disruption that public safety leaders discover how to build capacity to meet these formidable changes and evolve operating models for the future, while preserving the legitimacy that society needs, and delivering the outcomes communities demand. Complexity: The operating environment for public safety organizations is changing dynamically. Leaders must not only enhance their capability to engage with communities and stakeholders in preventive policing solutions, but also respond to evolving and real-time threats such as cybercrime, civil unrest, and domestic terrorism. Convergence: The fusion of digital surveillance, data-rich networks, and social technologies creates new opportunities for intelligence-led policing. To build community trust in the public value these technologies promise, leaders must harness this new opportunity while carefully balancing individual liberties and protecting civil rights. Capacity: Public safety organizations remain under unrelenting pressure to do more with less. Leaders are moving to new operating models and organizational structures to improve efficient use of resources, while simultaneously reforming policy and policing strategies to achieve more effective outcomes. Culture: As societal expectations of public safety change, the requisite shift in policing methods can be jolting to the identity and culture of the organization. Leaders must not only reshape their organization’s mission, but also help stakeholders and employees understand and embrace new ways of working, roles, and identities. These challenges lead to tough questions: How should leaders deal with seemingly conflicting demands? Which new strategies are proving to be best practice? How can leaders empower their personnel and pace the adaptation of their organization? What does the public safety organization of the future look like? What outcomes will underpin its mission, and define its success? 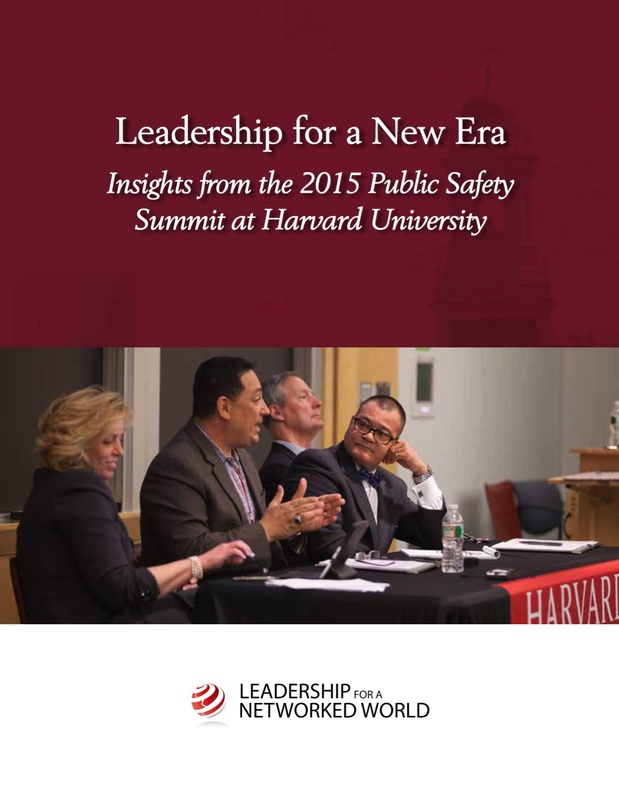 To help public safety leaders address these questions and set a vision for the future, Leadership for a Networked World and the Technology and Entrepreneurship Center at Harvard, in collaboration with Accenture, are convening The 2015 Public Safety Summit: Outcomes for a New Era, to be held April 24 – 26 at Harvard University in Cambridge, Massachusetts. Identify strategies that organizations, inside and outside of public safety, have used to successfully adapt to societal change. Share strategies for adopting emergent technologies and new operating models while balancing individual privacy, due process, and civil liberties. Gain leadership insights on transforming your organizational design and culture to improve performance, engage stakeholders, and build public trust. This Summit builds on a decade of research by Harvard Kennedy School’s program in Criminal Justice Policy and Management and will feature fresh case studies, peer-based problem-solving sessions, and topical workshops with Harvard faculty and researchers. Participants will leave the Summit poised to lead their organizations into the newest era of public safety.